Candidates who are seeking admission in Indian Institute of Technology (IITs), National Institute of Technology (NITs), Indraprastha Institute of Information Technology (IIITs), and Government Funded Technical Institutes (GFTIs) should fill the JEE Main 2020 Application Form. These institutes offer admission in various branches of engineering as well as in the architecture program. National Testing Agency (NTA) is the responsible body for conducting the examination. A candidate can apply for the examination for 6 times only. In order to take admission in IIT, a candidate has to qualify JEE Main and after that JEE Advanced. Make sure that you apply for the exam before the last date so that you do not face last minute hassle. Candidates should be aware of the dates of the different events. The tentative dates of the various events is available in the table below. Candidates should meet the eligibility in the first place for filling the application form. The information brochure will contain the eligibility criteria in detail. Candidates have to meet the conditions such as Educational Qualification, Percentage and others. NTA will not accept the application of a non-eligible candidate under any circumstances. Further, check an over view of the essential qualification below. A candidate should possess the Nationality of India. Other than Indian citizen, candidates like OCI / NRI / PIO / Foreign Nationals can also apply. There are no criteria of the age limit of any candidate. But the only condition is the candidate’s date of birth should fall on or after 1st October 1993. Candidates should have scored 75% in class 12th with Physics and Mathematics as compulsory subjects along with one of the Biotechnology/ Chemistry/ Biology/ Technical Vocational subject. 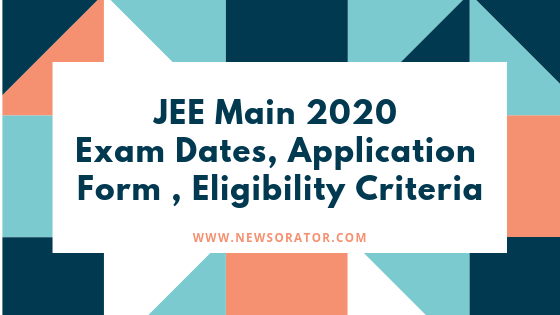 The JEE Main 2020 application form shall be available online at the official website which is jeemain.nic.in. Candidates should submit the form in online mode only. Candidates are not required to send the printout of the application form either through registry or speed post. While filling the form, use correct information only. NTA will not entertain the such application form which will carry improper details. The details such as Personal information, Educational information are required to apply. Read the process of submission of the application form below. Then click on the Apply for JEE Main 2020 button. After that enter the details such as Name, Parent’s Name, Education details, Address, etc. Further, upload photo and signature in the required file size and format. Make payment of the application fee either online via Debit Card, Credit Card or Net Banking or offline via Bank challan. After filling all the details, submit the application form. Take the printout of the filled in application form for the future reference. Check the details of the application fee here.